If you eat a piece of food that’s been on the floor less than five seconds, can you avoid ingesting any germs? And which bounces higher, a frozen tennis ball or a heated tennis ball? These questions and many more were considered, hypothesized, and tested as part of Whitehall Elementary School’s annual Science Fair, held last Tuesday in the school gymnasium. 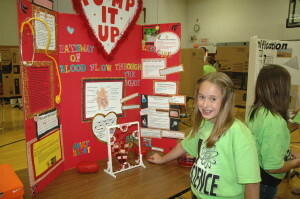 Around 80 fourth and fifth grade students created projects for the science fair. Participants were required to think of a question, research the topic, and develop a means of answering that question. As a primer, students watched several episodes of Discovery Channel’s critically acclaimed MythBusters series as an example of how they could use scientific methods to answer their questions. They also spent weeks, and in some instances months, studying their topics in the school’s library. “Some of the students have been researching their topics since February,” Lestage said. Some questions came directly from subjects discussed in class while others came from personal experiences or just plain curiosity. For instance, Morgan Austin and Faith Chapel decided to mummify a chicken (one that had already expired and been butchered) after learning about the process online, while Olivia Ruby and Hannah Schmeekle decided to put the five-second rule to the test after hearing it was alright to eat food that had fallen on the floor as long as it was there less than five seconds. Other students delved into the world of physics, engineering, the human heart, geology, volcanic eruptions, the solar system, zoology and much more. “The kids really took the concept and ran with it,” Lestage said. Participation in the event was voluntary for fourth graders, and mandatory for fifth graders, the first time the older students were required to participate. “The fifth grade teachers really saw value in it. It’s an experience you’re not to get besides being here and being involved with this,” Lestage said. Each project was evaluated by a panel of judges for presentation, thoughtfulness (how much the students knew about the topic), clarity and visual aides. Each project received an overall score and the top five projects in each grade were ranked and students received a medal and lanyard. Every student who participated received an “I Love Science” t-shirt. And as it turns out, a heated tennis ball bounces higher than a frozen one and you shouldn’t eat any food that has fallen on the floor (regardless of how long it’s been there), or a six-week old mummified chicken, for that matter.